The Dorset countryside has stood in for Mars as scientists hunt for life on the red planet. By studying a stream on the Jurassic coast, experts have calculated how much organic matter we might find on Mars, and where to look. When they applied their findings to the red planet, they concluded there could be nearly 12,000 Olympic-sized pools of organic matter on Mars. The team found traces of fatty acids - key building blocks of biological cells - in an acidic stream in Dorset. Because modern-day streams in Dorset are similar to Mars' ancient waterways, the findings hint that life existed on the red planet billions of years ago. 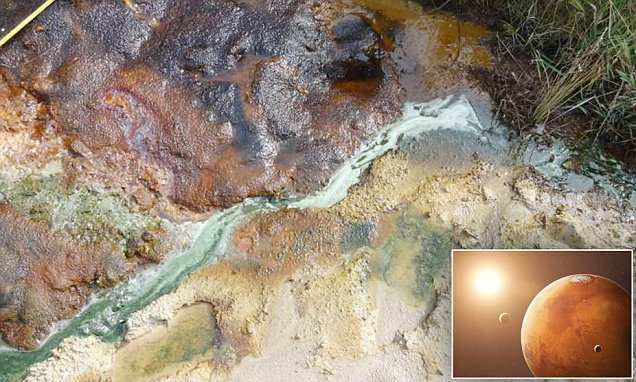 Dorset is home to highly acidic sulphur streams that host bacteria which thrive in extreme conditions. One such environment, in St Oswald's Bay, near Weymouth, mimics the conditions on Mars billions of years ago. Researchers at Imperial College London treated the landscape as a template for Mars and examined the organic matter preserved in rock deposits nearby. The iron-rich mineral goethite transforms to hematite which is very common on Mars and gives the planet its red colour. If the iron-rich minerals harbour traces of life on Earth, then scientists say they may hold clues to past microbial life on the Red Planet. Study co-author Jonathan Tan said: 'St Oswald's Bay is a present-day microcosm of middle-aged Mars.